What’s the Difference Between the Yacht-Master and the Yacht-Master II? Ever since the debut of the Explorer II in the 1970s, Rolex has often released a “Part II” of a collection. Sometimes, the second edition of the collection is very similar to the first (for instance the Datejust vs the Datejust II) and sometimes the two collections, like the Yacht-Master and the Yacht-Master II, offer completely different watches. If you’ve ever wondered what the differences are between the Rolex Yacht-Master models, then continue with our guide on comparing them. There are many differences between the Yacht-Master and the Yacht-Master II. Rolex introduced the Yacht-Master collection in 1992 as a top-tier luxury watch with a nautical flair. This was not a utilitarian tool watch like the Submariner or the GMT-Master (although you can use the rotating bezel to time elapsed events) but rather, a sporty chic high-end watch to wear while at sea. Indeed, the full 18k yellow gold construction of the inaugural 40 mm Yacht-Master set the luxurious tone of the collection. Two years later Rolex rounded out the collection by adding midsize and ladies’ size versions of the Yacht-Master. 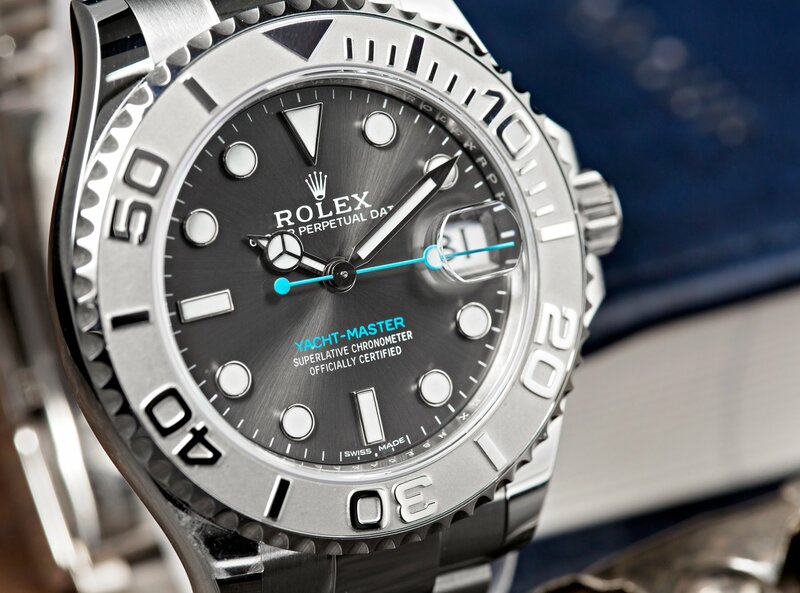 The Yacht-Master II joined the Rolex lineup in 2007. Unlike the Yacht-Master, the Yacht-Master II offers much more functionality for sailors thanks to its regatta timer to use during competitive races. The Yacht-Master and the Yacht-Master II is a watch made for the yachting community. Aside from telling the time, the Yacht-Master and the Yacht-Master II are quite different functionally. Powered by Rolex Cal. 3135 with a 48-hour power reserve, the dial of the Yacht-Master houses center hours, minutes, and sweeping seconds along with a date window at 3 o’clock. On the other hand, the Yacht-Master II runs on Caliber 4161, which is one of Rolex’s most complex movements to date. In addition to the center hour and minute hands and running seconds subdial (and no date), the Cal. 4161 furnishes the Yacht-Master II with a regatta countdown with patented mechanical memory and on-the-fly-synchronization. What’s more, the bezel, dubbed Ring Command, is not just for exterior looks and functionality, but it also controls part of the movement inside the case. The Yacht-Master II has 72 hours of power reserve. The Yacht-Master and the Yacht-Master II in rose gold is another hit by Rolex. The men’s Yacht-Master sports a 40 mm Oyster case topped with a rotating bezel with raised numerals. 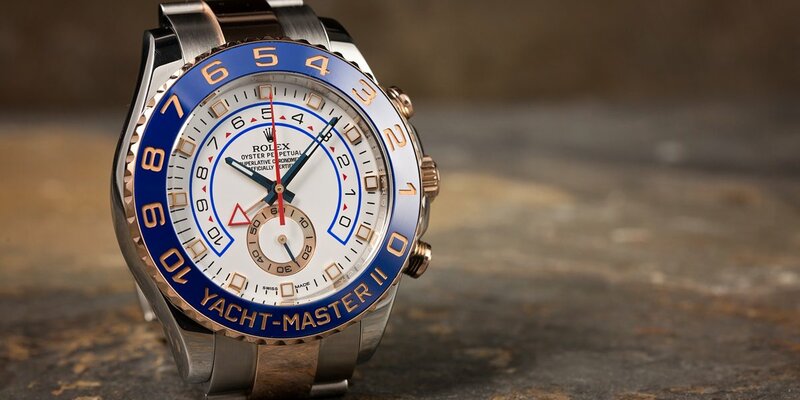 The dials of the Yacht-Master are similar to other Rolex sports watches with Mercedes-style hands and round/baton/triangular luminescent indexes. 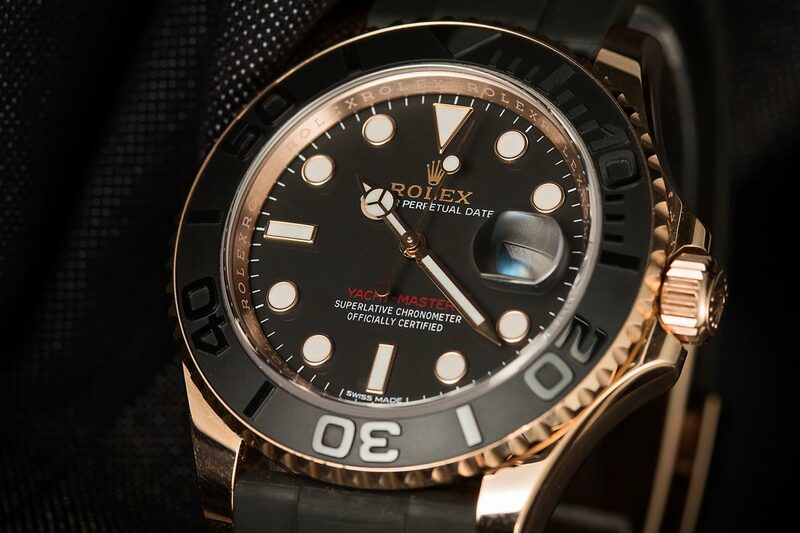 While Rolex originally made yellow gold and two-tone yellow gold and steel versions of the Yacht-Master, the company has now replaced these with full Everose gold and two-tone Everose gold and steel models. When Rolex introduced Everose Yacht-Master, it was the first watch to include the Oysterflex bracelet composed of a metal band wrapped in black rubber. 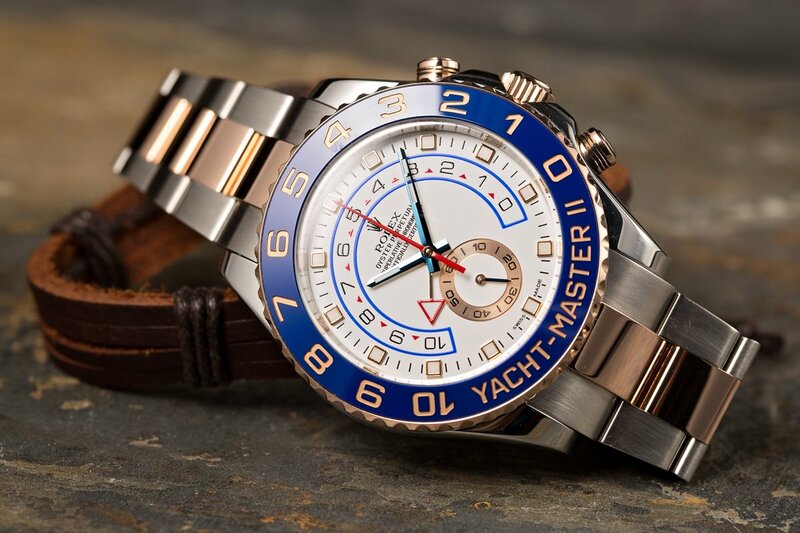 The steel versions of the Yacht-Master include platinum bezels. Rolex used to make 29 mm versions and 35 mm versions of the Yacht-Master, but today the only sub-40 mm size is the Yacht-Master 37. Conversely, the Yacht-Master II is only available in one size—a very large 44 mm Oyster case. That case comes with a blue Cerachrom ceramic bezel (except for the white gold version which includes a platinum bezel). The dials of the Yacht-Master used to include blue pencil-style center hands and square indexes. However, in 2017, Rolex updated the dials (but kept the same reference numbers) to feature Mercedes-style, plus added baton and triangle indexes at 6 and 12 o’clock, respectively. Should Rolex have made these two models so differently? Let us know in the comments below. They may share a similar name, but as we’ve illustrated, the Yacht-Master and the Yacht-Master II are far from the same watch. The first is a luxurious time and date Rolex sports watch while the latter is a big, bold, and complex Rolex watch built for competitions. Regardless of which version of Rolex’s yachting watch you choose, they are both statement watches in their own unique way.